For more than a century, Wisconsin has been known nationwide for its progressive ideas and government. It famously served as a "laboratory of democracy," a cradle of the labor and environmental movements, and birthplace of the Wisconsin Idea, which championed expertise in the service of the common good. But following a Republican sweep of the state's government in 2010, Wisconsin's political heritage was overturned, and the state went Republican for the first time in three decades in the 2016 presidential election, elevating Donald J. Trump to the presidency. 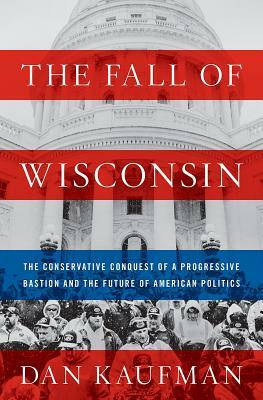 The Fall of Wisconsin is a deeply reported, searing account of how the state's progressive tradition was undone and turned into a model for national conservatives bent on remaking the country. Dan Kaufman, a Wisconsin native who has been covering the story for several years, traces the history of progressivism that made Wisconsin so widely admired, from the work of celebrated politicians like Robert "Fighting Bob" La Follette and Gaylord Nelson, to local traditions like Milwaukee's "sewer socialism," to the conservationist ideas of Aldo Leopold and the state's Native American tribes. Kaufman reveals how the "divide-and-conquer" strategy of Governor Scott Walker and his allies pitted Wisconsin's citizens against one another so powerful corporations and wealthy donors could effectively take control of state government. As a result, laws protecting voting rights, labor unions, the environment, and public education were rapidly dismantled. Neither sentimental nor despairing, Kaufman also chronicles the remarkable efforts of citizens who are fighting to reclaim Wisconsin's progressive legacy against tremendous odds: Chris Taylor, a Democratic assemblywoman exposing the national conservative infrastructure, Mike Wiggins, the head of a Chippewa tribe battling an out-of-state mining company, and Randy Bryce, the ironworker whose long-shot challenge to Speaker of the House Paul Ryan has galvanized national resistance to Trump.